This cucina povera recipe from the Greek island of Crete, home of some of best ingredients in Greece, couldn’t be easier. I use the Italian term ‘cucina povera’ ‘poverty cooking’ because there is an equivalent in Puglia, a dish called variously Frise, Frisa or Frisella. I was shown this dish by executive chef Alexis Lefkaditis of the Blue Palace Hotel and Spa. 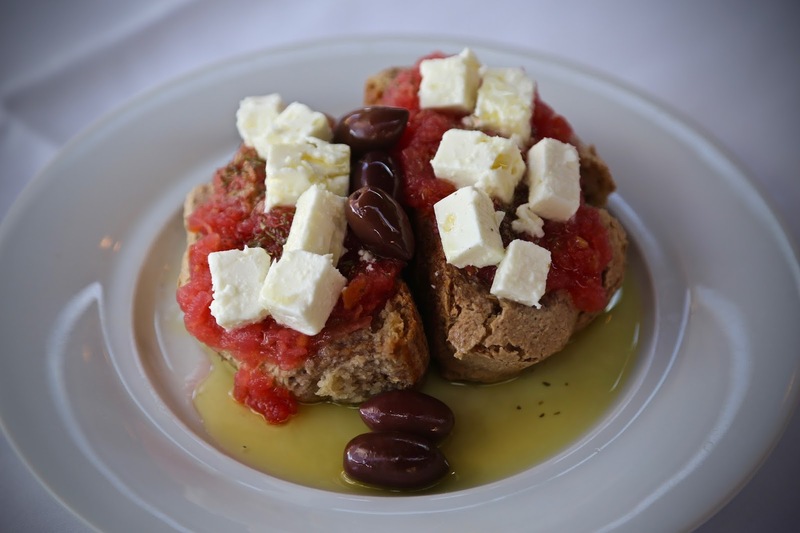 He explained that traditionally the hard Cretan barley rusk (‘paximathi’), the basis for this dish, came about because the Cretan women worked in the fields like the men and didn’t have much time to bake. So they would make a huge batch of bread then dry it in a low oven. This way it would last a month. The rusks would be softened by pouring a little water, wine or olive oil on it then skinned crushed tomatoes, oregano, some black olives would be added. 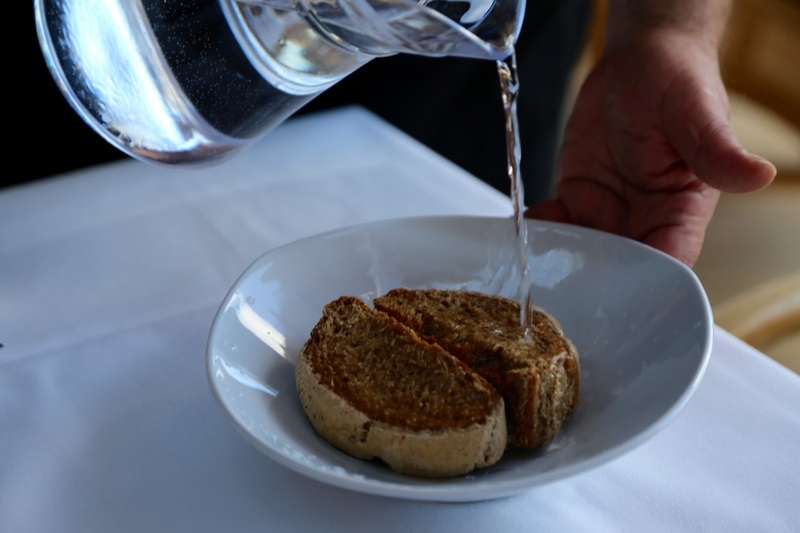 Alexis also mentioned that they would make this barley rusk from a sourdough using water where Greek basil had been soaked. Summer is over, but if you have a few home grown tomatoes left or can still get hold of some decent tasting tomatoes, have a go at this hearty, peasant-style salad. My kind of food. You can buy barley rusks in North London in areas like Green Lanes in Haringey which has a large Greek cypriot population. You can also order them online from here at the Isle of Olive. Place the rusks on a plate, pour a little water on them. Drown them in olive oil. Then top with oregano, sea salt, feta and bung a bit more olive oil for good measure. I’m on this trip courtesy of #discovergreece, the Blue Palace hotel a Luxury Collection Resort & Spa, Elounda, and Aegean. I love the friselle! This sounds good, too. This is great. My hand baggage consists almost entirely of Cretan rusks! That looks so yummy. Can't go wrong with sourdough, tomatoes, feta and a lot of olive oil. I'd put some roasted red peppers on there too, if that's allowed. It's allowed! In my book anyway…. How was the rest of your trip? I've never been to Greece but I'd absolutely love to go. It'd be great to more recommendations of what to do and eat there. The photos so far on Facebook and Instagram are stunning! I'd also like to go to Santorini to taste the wine and thessalonika and …all of it!